Winner of countless awards, Barbra Streisand has recorded over 60 albums and remains one of the world's most prolific recording artists in addition to being a true legend of both stage and screen. Yet such statistics never really do justice to her success. Likewise, having witnessed Streisand's sensational and powerful singing at her first ever Irish concert appearance as part of a select few dates on her debut European tour, it is obvious that no choice of adjectives could ever do justice to the star quality that oozes from this lady. Wearing a simple black evening dress and jacket and the inevitable sparkle that one would expect, a stunningly beautiful Streisand (who at 65, looks like a mature Jennifer Aniston) gave a flawless performance of a set dominated by big ballad style show songs. With an illuminated stately home as a backdrop to the massive staging, which was large enough to accommodate and conceal most of her impressive 58 piece orchestra, the American performer was on top form and perfectly at ease (even abandoning her shoes at one point and bringing her husband on stage at the end) as she continually engaged with the 17,000 strong audience between numbers. Every song may have been a show-stopper in its own right with each prompting yet another standing ovation for Brooklyn's Babs', but You Don't Bring Me Flowers, Somewhere(from West Side Story, with her male quartet of Broadway tenors) and the three encore songs, Don't Rain On My Parade, I've Dreamed of You and Smile (with the entire audience singing along) were particular stand-out moments. In terms of performance and prestige this was easily the musical event of the year and worth the high ticket prices, which makes it all the more tragic that , for thousands, anticipation turned to frustration and anger as inadequare traffic controls and other organisational problems turned this dream into an expensive nightmare, causing them to miss most of the concert (I only got to my seat at 10.30pm!). 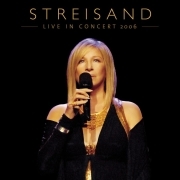 Thankfully, only a true superstar like Streisand can shine through such a shamble to make it still seem worthwhile. Genuinely surprised by her warm and raucous welcome, I believe and hope that Streisand will be back, but I had to chuckle at the irony of the situation when she told the crowd: " I can't believe how long it has taken me to get here.."
Don't worry Barbra, thousands of latecomers took even longer!